On my way to Chaco Canyon for the first time, I passed through Gallup. It was July 4, and a banner announced a fireworks display that evening at Red Rock Park. After settling into the campground at Chaco Canyon, I was gazing into the entrancing night sky, where every star seemed as if you could just casually reach up and touch it. Suddenly, I heard loud sounds breaking a peacefulness I’d never known before. As the booms continued, I rationalized that it must be coming from the fireworks at Red Rock, but I was surprised they would be that loud from such a distance. Then I realized the sound was not from a land source, but from the heavens, displaying brilliant lightning with trailing thunder. They were nature’s fireworks! To this day, 25 years later, I still get teary-eyed over that beautiful experience. About 16 years ago, my wife, Meri, and I began contemplating retirement from our family business in coastal Massachusetts. Since Meri is originally from New York and I was born in Massachusetts, we decided that we would retire to someplace geographically distant from the Northeast. It was too hot and humid in the Deep South, weather was too extreme in the Midwest, too rainy in the Northwest, and there was too much shaking of the ground in California. That left the Southwest, which we had never visited. Our first exploratory trip was to Sedona, Arizona. After a lovely week there, we decided that it would be a fine place to retire to, provided we wanted to spend the rest of our lives staring at red rocks! That was not for us. The next year we decided to visit Santa Fe. It was August 1998. It wasn’t until we arrived that we were told that it was Indian Market weekend. Barely managing to find a parking space near the cathedral, we explored Santa Fe with street map in hand and camera hanging from neck. Complete strangers asked if we needed directions. We got tickets to experience Pinchas Zukerman at the Santa Fe Chamber Music Festival. We visited Shidoni [Foundry and Gallery, in Tesuque]. On day two we decided that we had found the place to spend the rest of our lives. In October 2000, we returned here for two days, bought a home near Eldorado, then sold our business and house in Massachusetts and moved here in May 2001. It was one of the best decisions we ever made! And we even knew that it was part of the U.S. I am from Pittsburgh, with Virginia roots, and my first introduction to Santa Fe was at the Hotel Plaza Real (now Hotel Chimayó) as I was in town visiting a friend. One morning, still suffering from jet lag, I got up at 6 a.m. and decided to walk around the Plaza. In the morning mist, a lightbulb went off. I was in another time and place and just felt like I was home. What was this growing longing that opened my eyes to the mountains and the clouds? Oh my gosh, I’ve never seen clouds like this, and the vistas seem to go on forever and ever! I was hooked. Done deal. Over. This was where I was meant to be. I live life to the fullest, doing my day-to-day work, hobby farming, and quilting, and when I’m not busy, I’m on the porch taking photos of clouds and mountains. While my husband drives, I’m often taking pictures out the window. 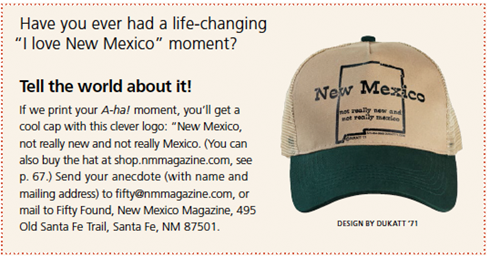 My life is now taken up with New Mexico history, going to Southwest Seminars and School for Advanced Research lectures and concerts, New Mexico Magazine for ideas, travel brochures, and AAA maps. I have trouble deciding which rock-art site, which historic church, town, museum, and which new marvel in the state to go to. Sometimes I am overwhelmed. I want to visit every little nook and cranny. My husband and I just get in the car and drive to one destination and end up pulling off the road because something has intrigued us, like that ghost town of Cuervo, or finding that remarkable dinosaur museum in Tucumcari, and old Route 66 towns with these fantastic old remnants of motel signs from long ago. Or getting a call from friends who were going to Kokopelli’s Cave, in Farmington, for the night, and would we like to join them? What other state has so many World Heritage sites? Or sacred places? Pueblo dances year round? We are at the top of the list! Since moving here, I’ve never looked back. I’m not lost anymore, but New Mexico found.